Plexiglas acrylic mirror in sheets - when to use which thickness? This little post will save you a lot of grief and money. 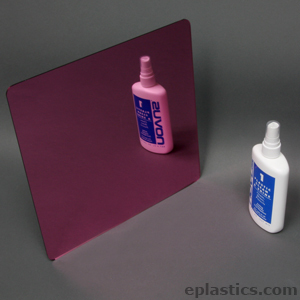 Plastic mirror is really a "reflective surface". It's not as rigid as glass, so it must be mounted FLAT to give a nice consistent reflective surface. Most mirror is considered a SECOND SURFACE MIRROR. 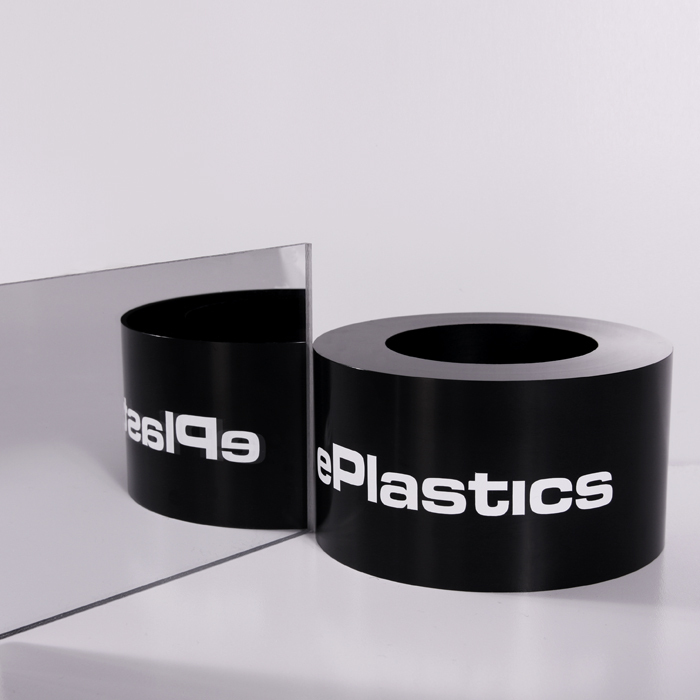 That means the FIRST surface is the front of the clear substrate, and the aluminum coating that makes the "mirror" is on the SECOND surface. So you get a little "ghosting" from the reflection off the first or front surface. When you mount acrylic mirrors, the wall must be FLAT or the acrylic will bend to fit into the dips and bumps. From a few feet away, it's not too bad. From 10ft you look like Godzilla. From 30ft you look like - well, you're a blob in the reflection. Now, if you take the time to prepare the wall, smoothing the bump out, you'll be much happier. You must use the thicker 1/4" thick mirror for a reasonable outcome. The thinner 1/8" acrylic mirror is great for small applications up to say 16x16, and for close use. You cannot expect 1/8" mirror to look good in a dance studio, or full length dressing mirror. That said, the beauty of acrylic mirror is that it's 1/2 the weight of glass, and is very difficult to break. So whether it's a gym, dance studio, or mental hospital (yes, really) it's a great material for a very specific application. The are some variations on the mirrors.. there are a range of stock color, and by special order, you can get 2-way (see-thru) mirror for interrogations, and FIRST surface mirror which ends up being a double sided mirror. There's a lot of laser-cutting of mirrors for front license plates, and even jewelry! More on 2-way or "see-through" mirrors in a later post! Hi Plastic Genius, Your site is very helpful. I'm working with plexiglas and have been bending it by heating it up in an oven and then bending it. However, I just started working with iridescent mirror plexi, but when I heat and bend it, it seems that the iridescent mirror layer crinkles and looks bad. I've seen examples of the same plexi bent without the crinkles. Do you have any idea how to keep it looking smooth as I bend it? Thank you so much! Oh - no good news on this. Sounds like you have the Radiant Acrylite material. Very cool. But that look comes from a film applied to 1 side of the sheet. Can't bend that.